California Lemon Law Attorneys - lemon law for cars. Are you driving a "LEMON"? Would you like to know if your vehicle qualifies for a California lemon law case? Find out right now... It's 100% FREE! Having problems with your vehicle? Talk to the California lemon law auto expert – Randy Sottile. There is no reason you have to put up with a 'LEMON' vehicle. We are here to help you. Call 1-800-225-3666 today! A Lemon Law Case With Us Is Easy and 100% Free! Read more about your legal rights and entitlement under our California lemon law. As a California resident… you have rights under our California lemon law! a repurchase (buyback) of your vehicle proven to be a “lemon” under the California lemon law statute. receive a refund based upon the original acquisition price of the vehicle, less a charge for usage based upon the odometer miles at the first of what became repeated repair attempts. the attorney’s fees and costs being billed to the automobile manufacturer, not you. ask for a new replacement vehicle for your defective new vehicle, if both you and the manufacturer agree. hire us, the California lemon law attorneys, Law Offices of William R McGee with no out-of-pocket expenses. keep your vehicle and pay us nothing if we do not reach settlement on your case. have your lemon law lawyer provide you with timely updates to your ongoing case. have a team of lemon law lawyers that has your best interests in mind, and works for the highest possible dollar settlement. hire a lemon law attorney that has 30 years of experience, and has settled over 19,000 California lemon law cases. hire a lemon law attorney that serves your area. We have offices in Los Angeles, San Diego, Irvine, San Francisco. We are statewide. hire a lemon law lawyer that has an on-staff Auto Expert, as this is a critical resource in pursuing automobile manufacturers. California residents who purchased their new or used car, SUV, truck, van, cross-over, or motorhome with a manufacturer’s warranty have lemon law rights when their purchase (or lease) has been subject to too many repeated warranty repairs. In fact, the California lemon law is one of the strongest lemon laws in the nation. It offers the best consumer protection, has built-in provisions for attorneys fees and costs, and bases the refund upon the initial purchase price, not the current value of the vehicle. Having the California lemon law attorneys, California’s largest statewide lemon law attorney firm represent you in a lemon law case/claim is your best consumer protection and representation choice. Read about our California lemon law statute. See the answers to consumers frequently asked questions. If you would like us to answer your California lemon law questions by text messaging to find out if you have a case… CLICK HERE (from mobile phone) or text your questions to 1-858-342-0073. If you would like us to review your warranty repair invoices, upload your repair documents here. If you’re having any type of repeated mechanical problem(s) with your vehicle, we encourage you to use our free auto expert question/answer feature. Please CLICK HERE to post your question. Your question to California lemon law attorneys’ auto expert Randy Sottile, and his answer back to you will be kept confidential to your email address, and not shared with anyone else. Call 1-858-342-0073 or email the Lemon Law Auto Expert, Randy Sottile, about your vehicle problems/issues! Repeated warranty repairs? Unsafe vehicle? Dealer not getting your vehicle repaired? Are you “done” with your defective vehicle, and want it bought back? Need to know what your legal rights are under our California lemon law? You may have a California lemon law claim and case that will allow you to return the vehicle under the California state lemon law statute for a buyback and get a refund of all the monies and payments you have made, as well as a payoff of any loan or lease balance. California lemon law cases can also settle with the manufacturer replacing the offending new lemon vehicle with a new, current year model of your choice of the same MSRP price. In some cases we can negotiate with the manufacturer to allow you to keep your vehicle (if you desire to) and receive a payment in the thousands of dollars for the inconvenience you have encountered with all the past repair visits. Call California lemon law attorneys today at 1-800-225-3666 and receive a free California lemon law consultation. California lemon law relief for all California residents. Your lemon law rights are all within the California lemon law statute, which is located on this website. The California lemon law (Song-Beverly Consumer Warranty Act, and the Tanner Consumer Protection Act / California Civil Code Section 1793.2, 1793.22) was enacted to protect California consumers from having to deal with repeated repair visits back to the dealership for factory warranty repairs. Has your new or used vehicle been in the shop over and over again for dealer warranty repairs? You may have a California lemon law claim and case that will allow you to return the vehicle under the California state lemon law statute for a buyback and get a refund of all the monies and payments you have made, as well as a payoff of any loan or lease balance. California lemon law cases can also settle with the manufacturer replacing the offending new lemon vehicle with a new, current year model of your choice of the same MSRP price. In some cases we can negotiate with the manufacturer to allow you to keep your vehicle (if you desire to) and receive a payment in the thousands of dollars for the inconvenience you have encountered with all the past repair visits. Any new or used vehicle that has remaining factory warranty coverage, or manufacturer “Certified Pre-Owned” used car warranty coverage may be a candidate for consumer protection under the California lemon law. Consumer information on lemon law warranty repair attempts: To protect your legal rights for a potential California lemon law claim/case, we suggest the following… When visiting your authorized dealer for repairs to your vehicle under the manufacturer’s warranty, be sure that the wording on the Repair Order of your complaint are your words of your description of the problem/symptom, not the Service Advisors interpretation of what you are saying. Equally important for a California lemon law claim/case is that when the vehicle goes back for a “repeat of same problem/symptom”, that you keep the customer complaint wording consistent on each Repair Order in sequence. This adds strength to your California lemon law case. Mentioning possible action under the California lemon law to the Service Advisor is not recommended. Discussing your vehicle being a “lemon” will almost certainly “flag” your vehicle, and more than likely it would come back after a repair with “could not duplicate customers concern”. Manufacturers are very savvy on lemon law issues – and so are their dealers. After all, they have trained them. If you are missing any Repair Order invoices, you can request copies of them from your Service Advisor. The Service Advisor can also print out what is known as a “warranty repair history printout”, which details all repair visits to any/all authorized dealers for warranty repairs. Again, it is best not to mention “lemon law” to the Service Advisor as you will likely not get the copies of the documents you are requesting. A California lemon law case and claim are predicated upon Repair Order Invoices. These are the proof of your claim and repair attempts. Keep them in a safe place, away from your vehicle. If your vehicle is outside of the factory “bumper-to-bumper” or “powertrain” warranty, you may still be eligible for relief under the California lemon law. Or if you have had three (3) or more repair attempt visits at an authorized dealership for the same issue/problem/complaint before expiration of factory warranty coverage, and have repair order invoice documents that support this (or you get a warranty repair history printout from your dealer), you may be eligible for a substantial cash settlement under the lemon law. Also if you gave the automobile manufacturer written or verbal notice (telephoned in to Customer Assistance Center) of the continued warranty non-conformity issues during the warranty coverage period and continue to have the same issue/problem/complaint, you may potentially entitled to a repurchase (buyback) of your vehicle, even though it is out of factory warranty. California lemon law attorneys invite you to call us to discuss your out-of-warranty vehicle’s problems and warranty repairs history. The same applies to “Certified Pre-Owned Warranty” used vehicles, which enjoy the same lemon law protection as new vehicles. 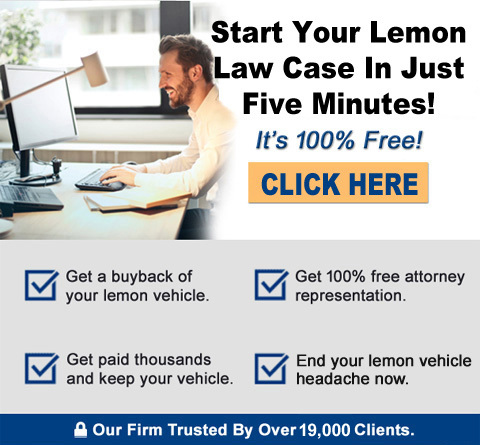 The California lemon law also requires that the automobile manufacturer pay for the consumer’s hourly attorney’s fees on a case and claim that settles for a repurchase (buyback), new replacement vehicle, or a cash settlement payment. This makes the lemon law economically feasible for consumers who would not otherwise be in a position to hire a lemon law attorney. We are California lemon law attorneys a California’s Largest Lemon Law Firm℠, with offices throughout California. Our 30 years of experience with all of the automobile manufacturers, and over 19,000 successful cases makes our firm the easy choice for the consumer desiring lemon law relief with highly competent representation. Many cases are settled in as little as 10 days. Mr. McGee personally handles all lemon law case communications with the automobile manufacturers, as well as with each of his clients. He aggressively pursues each California lemon law case for the best possible outcome for each client. The personalized service each client receives from Mr. McGee – and all associates of the firm – is unique to our area of law practice. We offer a level of professionalism rarely seen but greatly appreciated in today’s fast-paced legal field.